I would like to nominate an extraordinary woman named Antoinette Layoun. Her story begins in Lebanon where she became a child soldier. She later came to Canada and then Québec, eventually becoming a Peace Ambassador to events in Portugal and India. She founded a centre over nearly 20 years ago which helps people find inner peace and share this peace with the world around them in their daily lives. Her approach of the Human Architecture comes from her expertise and experience as a psychotherapist and Yogacharia, today known as Swami Shantiananda. Antoinette’s list of accomplishments is very long. Some can be found on the centre’s website (see two articles in French below). However, her main objective remains bringing peace to the daily lives of as many people as she can. Her book Les dix clés de l’amour was written to serve as a tool to teach others how to find peace within and a more loving approach to life. She is often invited as a guest on talk shows and live events to speak about her approach to peace. As someone in her entourage, who has known her for at least six years now, and who has also been her student, I can attest that she works unceasingly and tirelessly for peace with heart and determination. She participates in many activities at the centre, practices many hours of yoga and meditation, gives courses and provides coaching. She also takes part in events such as the ‘Festival du Féminin’, which took place in Montreal last October. She will also travel to Paris in spring 2016 for a similar event. Yet, even with such a weighted schedule and responsibilities, she manages to connect with every person who comes through her door. Antoinette has put in place initiatives such as 21DayforPeace, during which she guides people for 21 days in September on the road to peace through meditation and self-awareness. She has hosted enumerable events to raise awareness for peace – many taking place on September 21 every year. She also writes a weekly column for a local paper and has had her articles in many publications. Please allow me to tell you the reasons I am nominating Antoinette. The first is because this woman has given herself heart and soul to her mission of peace and I know that, for her, the work itself is her reward. I wish her to be acknowledged because it is important for us to recognize these beautiful people in our society, to give them the energy to continue their work. I also feel that the best way to thank her is to propagate her mission of peace. By speaking about her, we speak about her mission as the two are inextricable. Her aim is to bring individuals to finding inner peace and to giving up the war within. We know that inner peace translates into peace in all that we are and all that we do. I invite you to read these articles and discover Antoinette Layoun, this amazing woman of peace. Woman of heart and depth; inspiring woman for who knows her and follows her teachings, allowing us to spread her message of peace and love around us ; Woman of values that believes in the goodness of humanity and invites us to join. Antoinette thank you for your mission of peace … the world has great need . I feel privileged to follow you for many years now! Today I have the opportunity to speak of an outstanding individual who, at first contact, was able to come touch my heart . Currently in life that we live, it is very difficult to stop and recognize a single person , who gave itself the mission to help others , but more specifically to give people the opportunity to know freedom and peace. Thank Antoinette for his determination to create peace on earth and I support her candidacy for the Public Prize Peace. It is with joy that I support your nomination dear Antoinette . Your great determination to spread peace and love around you and nourrish them within you, the actions that you do every day to transform the shadow into Light , you are the ideal candidate. Thy radiation extends everywhere on this beautiful planet that needs it so much . Namaste ! Antoinette allows people to contact the best in them . In addition , reducing inner violence that humans do to themself , it reduces the external violence and bring peace . Antoinette , for me breathes a freshness by her way of being and through her teachings and knowledge. She is a beautiful woman by what she radiates. What I admire most is that of Antoinette lives the lessons she offers us . This is a being who teaches PEACE , WISDOM , courage , clarity , it teaches me to stand up , to line up , to advance, to believe in me and in our Humanity . I feel that her life mission is to make our humanity better. Listening , her non-judgment , patience , lightness, joy of life, are of unspeakable value and helps me to keep moving , it makes me want to sow what she teaches us . Antoinette thank you ! Because it inspires peace, inner beauty, a person of great inspiring value represents the universal love. It is a privilege to attend training with Antoinette . To get to know me gives me inner peace and helps me to be more empathetic to me and to others. The World Peace grows from each of us. I am grateful to know this great lady . It inspires peace through her great humanity , listening to the other and her fascination for the human being living in peace . I did not think my enconter with Antoinette Layoun would be that extraordinary . Antoinette is for me an exceptional person ; someone who makes a difference in life. I support Layoun Antoinette ! This lighthouse , this Light ! This expression of peace !! An awakener of consciousness that taught me to wake up and see me, to teach me to BE in peace !! I would like to share that Antoinette deserves this award for peace. I not know her for a long time and I thank life for having placed her on my path . I was greeted in her Yoga Chi & Meditation classes with all my difficulties , and just the fact of being in contact with Antoinette , an immense inner peace we feel and well – being immediate . This woman really good and sharing with great generosity . It is a gift to know her; those who are in daily are lucky . I would vote for Antoinette because to me sshe is love and hospitality to others as I have never yet met on my way . First she listens and understands you and then she is in love to others , at least that’s what I feel when I have the chance to meet her. Antoinette thank you for your good advice. It allowed me to learn more about me and my entourage. Also thank you for your fabulous and unique yoga . I met Antoinette Layoun after the death of my mother-in-law , I was upset . We did several sessions in therapy and she invited me at a Yoa chi & Meditation class. It made me a great mental and spiritual well . She helped me with my grief and find inner peace. Today I can say that I am inspired , too, to work in her field for me as well help people to find inner peace . I love her so much! Antoinette is my idol, my star , my inspiration! I support with great enthusiasm and joy of the heart then omination of Antoinette Layoun for the Public Peace Prize ! The answer loomed later with sharpness … a being who bears hatred in him as lack of love with himself. Her peace mission was born and since then, this woman with a big heart accompanied beings who want to live their potential life in the love of self and love of nthe other. By guiding us to connect with our inner peace, we become peace and that peace is reflected around us, while impregnating the peace of the world. I meet Antoinette for almost two years already and am infinitely grateful to accompany me on the path of self-love in his words, over the conversations, meditations, chi yoga classes, workshops, conferences and video-conferences. hearted woman who devotes herself to each new day it is given her, peace in every human being and of the Earth. Antoinette Layoun is an important person in my life … I started working in therapy with her after experiencing physical violence with the father of my children. I want to understand why I, a child who was so sweet, I find myself in a dynamic of adult violence. What makes this may switch at some point …. Antoinette helps me not only in individual meeting but also by her teachings, by her Yoga Chi & Meditation; I also had the chance recently to participate in a journey and be accompanied and guided by her. All her experience, she draws on her own personal transformation … Besides being a passionate person, Antoinette is a person who has worked primarily on herself and wants to share with the world the benefits her journey. Having found peace in herself, it aims to change the world one person at a time … ” Peace begins with us’ ” ‘find inner peace’ and we will bring world peace … is the motto of Antoinette Layoun. This makes her an ambassador of peace … by herself, by her example, her messages and her teachings, peace spreads in all of us … and transforms the world. Like a seed of love, she spreads around her self-love and inner peace. Antoinette spreads peace by who she is and through her teachings. Her teachings go through self-knowledge to the transformation of inner pain states at peace, love for ourself and for the other. For me, meeting Antoinette and her education was a turning point in my life, then I was taught how to become master of my happiness, she gave me a definition of happiness and concrete tools to touch it and live it daily . What a gift I received. It was very liberating. I spent my life to suffer in undergoing situations to love life, to become increasingly creative in my personal legend. Her empathy, her love, her teachings propel me every day to be a better person for myself and the other in the relationship. I see every day the work of Antoinette multiply. I see the transformation of my relationships with my children, with my family, in my work place, my friends, the same transformation in the relations of my children with their friends, cousins, uncles, aunts. That’s the extent of the work. Hearted woman, committed woman, she radiates and sows peace. And it’S with all my heart and gratitude that I support the appointment of Antoinette Layoun. 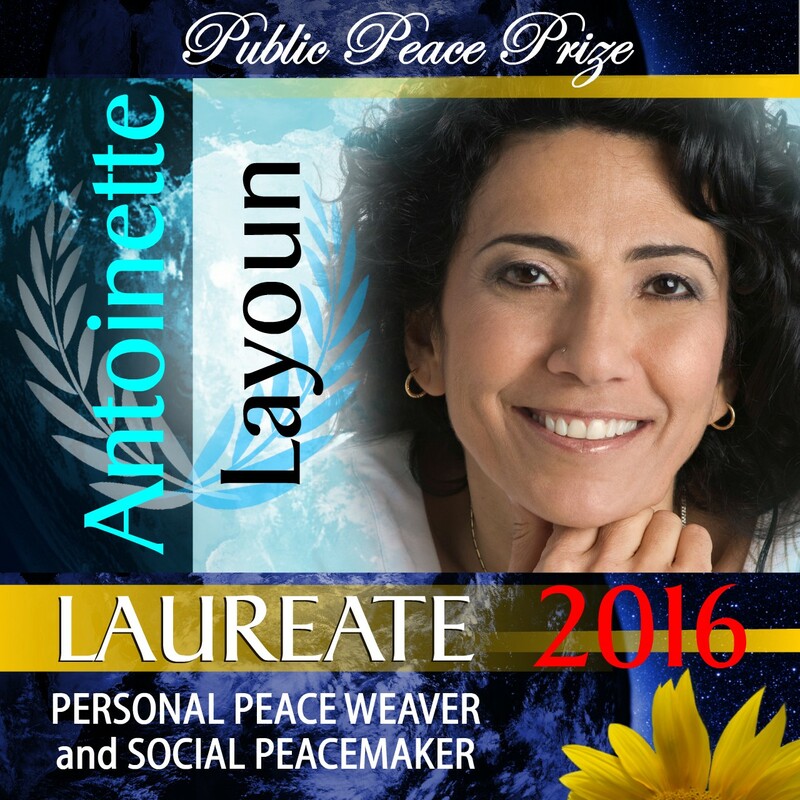 I would like to join my friends and Antoinette Layoun knowledge to nominate it to the Public Prize for Peace. Through her experience as a child soldier she has transformed with courage, she became Ambassador of Peace in his work and her daily life. She shows us by example, as a healthy authority, how to turn these states of war within us through these conferences and courses. Through the Centre Universcité Layoun Antoinette, she has created an environment where it is possible to exist without trial to find and develop this peace within us. Her faith in the human and ability to love and support is so great. By her teaching Yoga Chi and meditation, it created good opportunities to unite ourselves to this cause that is dear to her. We are proud she has represented Quebec in India as Ambassador of Peace. This extraordinary woman contributes to the well -being of hundreds of people. Through her work she helps people to thrive and propel themselves internally . She is an ambassador of peace, swami in the world of yoga. Because of her generosity and love for humans, it causes us to take steps in peace within us and also in our relationships with others . I wish to propose for this title Antoinette Layoun. This woman of heart and peace is simply a model of integrity for me. From child soldier to the ambassador of peace. For 11 years that I alongside, I have witnessed many times the greatness she carries in her heart. How many people she accompanies every day, both in individual as in her workshops, conferences, courses of chi and yoga meditation. Following her heart and her peace mission, she helps people to transform their state of peace in a state of war. Using C.O.E.U.R. Communication she created, in an area of knowledge / awareness, open to ourself and to the other, Empathy for ourself and for the other, United to ourself and then Radiates ourself. It makes a difference in life hundreds of people every week alongside the Centre via her Universcité Antoinette Layoun here in Deux-Montagnes, and web conferences that are broadcast worldwide. Thank you to accept the nomination of this woman of peace. It’s hard to explain just what it feels like to be in his presence, I feel a comfort. ..it gives off the sweetness, the home of the Heart, that peace that emanates from her aura and me, Viviane, I am fortunate to know her every week … Inside of me, it’s like I found something I had lost or forgotten in my life … Peace. Thank you for this beautiful life encounter that changed my life . I want to support the appointment of Antoinette Layoun . With its pure love of the human, she can transform every situation of everyday life into an opportunity to create peace within . I am pleased to propose Antoinette Layoun candidacy for the Public Prize for Peace. She travels the world to raise awareness about peace, but especially so among themselves and in them. She taught me to know me and be aware of how I think and act. She showed me to open up to me and to others also. See the other reacts with his experience own feelings..
She helped me to welcome me in my wounds and sufferings, to have empathy for me and the other as that, too, his own wounds, his own suffering. It helped me to see what is real versus what I perceive as real as altered by my functionning. And it allowed me to exist consciously in the radiance of what I am, what I wear, my freedom of Being and that, for me first. And this is for me the greatest peace ever …! I know Antoinette for over 10 years and have been accompanied by her was the best gift I received long ago. In early with yoga classes, courses and group workshops and now I attend training in therapy , this great lady of peace is communicating it everyday. She was also invited as an ambassador of peace at a meeting in India and a global yoga gathering. There is no better person to communicate and convey the message of peace in my opinion, it demonstrates in its day to day life, being herself in peace and harmony with those she encounters . I would like to second the nomination of an exceptional woman: Antoinette Layoun. From child soldier, she became an activist for world peace. She participated as a Peace Ambassador event in Portugal and India. She founded the Antoinette Layoun University center, where people from across Quebec come to attend various courses, workshops on wellness, to cultivate peace within and around the,. She developed the approach human architecture and communication HEART by her experience as a psychotherapist and Yogacharya. From where she was appointed by the French Association of Yoga “Swami Shantiananda”. Her achievement list is very long. She founded a website for the center and publishes several newspaper columns in the local newspaper in order to spread peace to many people as possible. She wrote the book The Ten Keys to Love, to teach everyone how to align itself in peace, with love for himself. She was also invited to television and radio to talk about her approach to peace. • in its participation in Montreal last October in the event of the “Female festival” and its invitation to Paris this spring for the same kind of event. Having such a busy schedule, she always manages to get in relation in a unique way with all the people who visit her at her center. She creates the 21 days for peace, a web event where she guides people for 21 days in September on the road to peace through a meditative accompaniment and this each year. She is also a columnist for a local newspaper and several articles were published in major newspapers known. That is why I want to support the appointment of Antoinette . Since this is a woman who is totally committed with his heart in his peace mission . I would like her to be recognized , to pay tribute to her work in her mission for. And also because the best way to thank her. Speaking of her, we talk about her mission , because both are inseparable from each other. Thank you to accept the nomination of this beautiful woman of peace what Layoun Antoinette . I am writing to tell you why I think Antoinette Layoun should be nominated to receive the award for peace. You already know her story. I’ll tell you mine. I have always lived with anxiety since young age and then are coming depressions. I was ia constant battle with myself and I was not not really happy. I met Antoinette ina confference where she explained the importance of this knowledge to be happy and at peace. I was very impressed, so I invited my spouse. He enjoyed it, we signed up to do a course to learn about our human psychological functioning. Then I started to do yoga chi & meditation, an approach she has developed, which brings peace of heart, body and spirit. The more I discover Antoinette the more I discover a woman who can stand up in her emotions and applying her teaches daily. Antoinette is a woman of heart, she gave me a place to her team where I do karma yoga or volunteering. With some depressions I’m not as functional, but I can be myself and I accepted that. She taught me what she applies for her peace with myself. Acceptance of who I am and what I experienced.Learning to love and then love others. Making peace in myself to radiate peace at home, in the community and on earth. Her mission is: Peace of heart for all. It starts by ourself. I think the fact that she lived war, Antoinette knows what it really means inner peace. 7 days 7 she carries her mission: to live in peace and help others to live in peace. Thank you to consider her nomination. When Amanda Bridget told me about the Public Peace Prize it was obvious to me: I have to participate in the appointment of Antoinette Layoun. It is with great honor that I present this great woman of peace. Antoinette Layoun has a singular course. At age 13 she enrolled as a child soldier in the army during the civil war in Lebanon. She then had immigrate in Canada, in emergency, with her family and her brother injured. Although she experienced the horrors of war, she understood in her student courses, as an entrepreneur, mother, therapist how wars exist within us first. And these little daily wars, we have full control to switch to Peace! That is why she has deepened her knowledge of herself and developed her work: Inner peace for all mankind. For almost 20 years she has worked as a therapist in order to get people to understand what happens in them so that everyone finds peace, self love, self worth and cultivates at last, inner peace. She also teaches the way of peace in his classes Chi Yoga & Meditation. She has authored numerous articles in magazines and Wellness Living and writes a weekly column in the local newspaper. It is a way for her to open the consciousness to even more people and to make known her message of peace. She is also the author of the book The ten key of love became Best Seller! As a story, it depicts the 10 essential keys to cultivate self-love and inner peace in everyday life. The teachings of Antoinette never complicated, although they reflected great ancestral philosophical teachings, always anchored in the concrete of our human reality with tools accessible to all, they are applicable to our day-tot-day life. Peace is the primary motivation of the work of Antoinette Layoun. We are all instruments of Peace. If each rayon and cultivates his inner peace, he will be able to radiate around him, his community, his city, his province, his country and ultimately across the Earth. This is the Antoinette message. Having turned her wars spaces in Peace spaces, Antoinette went from child soldier to Ambassador of Peace. Recognized as such by the French Federation of yoga, she participated in many peace rallies including two international, Portugal and southern India. It also bears the name of Swami Shantiananda. The title of Swami is a title of honor that is given to spiritual masters and teachers, Shantiananda means Peace and Bliss. It was given to her for her dedication to the influence of yoga and peace for the good of humanity. I meet Antoinette four years now as a student first and now I’m part of the team. I can assure that the Peace for Antoinette is something she lives and teaches daily. She is not just teaching peace and the responsibility of everyone, she applies it … it’s actually her way of life in all its relations! At her center, where she teaches and welcomes guests in therapy, she was able to create a microcosm of tomorrow’s world, this world she dreams, I dream … we surely live difficulties throughout our humanity but with the possibility of transforming it into a springboard to go a little higher and a little further in love and peace for ourselves and for each other. Every moment, I feel blessed to evolve at her side. She is an example for me and for many others. Thank you to consider this appointment with great attention. An exceptional woman, the extent of its features confidante, courage and selfless pure empathy is matched only by the ease with which its values to live joy and serenity are transmitted to hundreds, possibly to the thousands of people who were pardoned a contact, even ephemeral, with its light that penetrates the depths of our to illuminate us a new perspective on life. She exudes an inner peace she does. Antoinette is a woman of love and peace. This is a remarkable person! She is dedicated with heart and soul into everything she does. She inspires me to become who I am. I feel privileged to have crossed my path. I am very proud to apply for the candidacy of Antoinette Layoun. It is the wonderful person who taught me the most about me. It made me aware of so many things and especially the way that we can make a difference in our world is to start with we change ourselves. Act with compassion, love. To pay attention to our words and the power they have to us and to others. What if each of us did it in peace, the world would be better. This woman went from child soldier ambassador for peace is an example to me that everything is absolutely possible. During a journey , Antoinette allowed me to meet a painful espcae and bring me to cultivate inner peace . Inspiring. She exudes a wisdom , a strength. She knows to guide us to our own peace : peace of mind , peace in everyday life. Second, she accompanied me in my opening myself. I was ready to deepen me but I could never have done this long way if she had not been there. I learned more about me in 2 years with her then in 10 years of therapy with a psychologist! Her support allowed me to get my key, my access to myself. She introduced me to the track, often difficult, of responsibility towards ourself and the other. Her yogic teachings are also a great source of happiness for me. Postures she teaches us to allow my body and soul to grow.